In terms of project workflow, successful BIM implementation necessitates a front-loaded design process, where most of the modeling time is during schematic design and design development phases. During construction documents and construction administration (site visits, reports, and documentation), the workload is relatively low and levels off. The benefit of this is that front-loaded projects reveal potential design problems early on and the necessary coordination among the design team can occur sooner rather than later to resolve the issues. This is in contrast with traditional design workflows using CAD tools where the opposite is true and most of the drawing time happens during design development and construction documents. The problem with this traditional workflow is that conflict resolution and design changes tend to happen later in the project timeline, which are more costly than making the same changes early in the timeline. Figure 3.1 illustrates the time and effort relationship between BIM and CAD workflows across project phases. 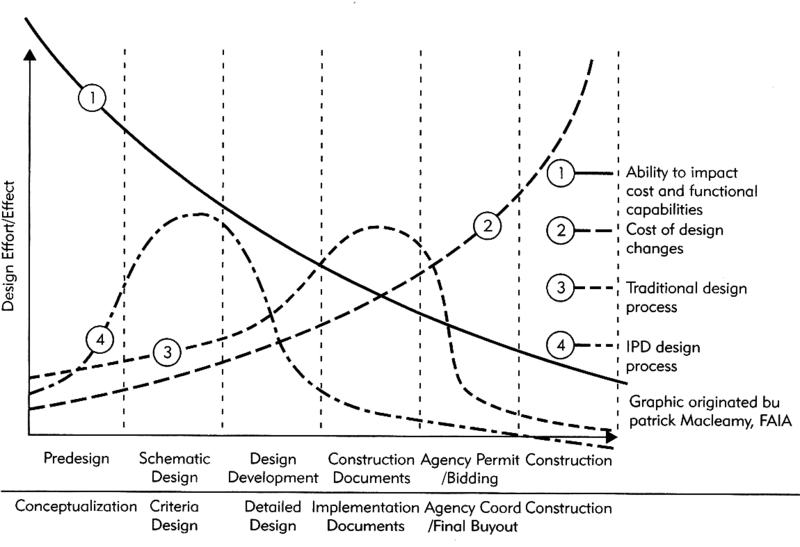 Figure 3.1: Traditional versus BIM/IDP workflows relative to design effort and cost of change over a project timeline. Source: Building Information Modeling: A Strategic Implementation Guide for Architects, Engineers, Constructors, and Real Estate Asset Managers, p 104. A major challenge with the emergence of BIM and the increasing project data flows between stakeholders is ensuring interoperability between technologies and software applications. Although most BIM authoring tools fit the criteria listed at the beginning of this chapter, each tool organizes and understands parameters and object data differently. Since the early days of CAD development, the strategy for addressing interoperability challenges was to develop exchange formats that translate information through importing/exporting from the desired software application. Eastman, et al. (2008), describes four ways that data exchanges occur between applications: 1) direct links between proprietary BIM tools; 2) proprietary file exchange formats; 3) public open-standard exchange formats; and 4) web-based HTML extension schemas. Direct links between proprietary BIM developers (commercial companies) do not require any modification of the native file format. An example of this includes Autodesk’s RVT format for its BIM tool suite. In this case, a single native file type is exchangeable across a single software platform. Proprietary exchange formats, on the other hand, allows information to be transferred between different types of software programs developed by a single company, such as Autodesk’s Direct eXchange Format (DXF), which communicates CAD data between current and legacy version. An attempt to bridge BIM model information across AEC industry groups has resulted in the development of a public open-standard exchange format known as the Industry Foundation Class (IFC), which has been supported by the buildingSMART International Alliance for Interoperability (IAI), a non-profit industry led international organization. The IFC is currently the most likely option for increasing interoperability between AEC industry groups, but at present there are still barriers to its adoption and use. Finally, there are eXtensible Markup Language (XML) exchange formats, which are based on HTML language used over the Web. The benefit of XML is that it can support small amounts of specific data between software applications. For example, gbXML, which refers to ‘green building’ XML-format, includes data about heating and cooling information typically used in thermal analysis programs. To be sure, there isn’t a single exchange format solution that will solve all BIM-related interoperability challenges and the success of BIM implementation will depend on continued support and development of these various exchange strategies. IPD leverages early contributions of knowledge and expertise through utilization of new technologies, allowing all team members to better realize their highest potentials while expanding the value they provide throughout the project lifecycle. At the core of an integrated project are collaborative, integrated and productive teams composed of key project participants. Building upon early contributions of individuals expertise, these teams are guided by principles of trust, transparent processes, effective collaboration, open information sharing, team success tied to project success, shared risk and reward, value-based decision making, and utilization of full technological capabilities and support. The outcome is the opportunity to design, build, and operate as efficiently as possible. The AIA further explains various aspects of IPD including: 1) team collaboration and communication; 2) roles, responsibilities, and service scope; 3) measuring project goals; and 4) risk assessment and contracts. IPD is envisioned as a specific type of project delivery method, which is intended to leverage the capabilities of BIM tools. One could argue that IPD is in response to the emerging BIM technologies coupled with the blatant inefficiencies of traditional project workflows and design tools. Interestingly, the AIA pointedly defines BIM as merely a tool and IPD as the process workflow, which seems to contradict several leading publications that define BIM as the successful combination of both tools and process workflows (Smith, Tardif 2009 & Eastman, et al. 2008). In any case, the goal of this research is not to take sides about which perspective is correct, but rather to identify that different perspectives exist as ideas about BIM and IDP become increasingly solidified in the building industry. Perhaps one of the most notable and documented benefits of BIM is the cost savings associated with eliminating inaccuracies, redundancies, and waste generated from conventional building practices. According to a 2002 study conducted by The National Institute of Standards and Technology (NIST), inefficiencies in the building industry accounted for an average increase in construction costs by $6.35 per square foot for new building design, construction, operations and maintenance. These figures were linked to inefficient management practices, the recollection/reentry of data, and the stalling of resources (human and material) throughout the project phases. Early adopters of BIM in the construction industry have reported reductions in project-related expenses and increased profits. In the end, it is the owner that reaps the economic rewards of a BIM process and workflow. Eastman, Charles M., et al. Bim Handbook : A Guide to Building Information Modeling for Owners, Managers, Designers, Engineers, and Contractors. Hoboken, N.J.: Wiley, 2008. 66-68. Eastman, Charles M., et al. Bim Handbook : A Guide to Building Information Modeling for Owners, Managers, Designers, Engineers, and Contractors. Hoboken, N.J.: Wiley, 2008. 72. The American Institute of Architects (AIA) and AIA California Council. Integrated Project Delivery: A Guide. Version 1, 2007. 2. Eastman, Charles M., et al. Bim Handbook : A Guide to Building Information Modeling for Owners, Managers, Designers, Engineers, and Contractors. Hoboken, N.J.: Wiley, 2008. 11. Smith, Dana K., and Michael Tardif. Building Information Modeling: A Strategic Implementation Guide for Architects, Engineers, Constructors, and Real Estate Asset Managers. Hoboken, N.J.: Wiley, 2009. 19-20. Can I use the content of this website in my research ‘How BIM changes architectural practices’? Go ahead and use the info for your research. Please cite and credit my work. Thanks. May I use the content of this website in my research ‘Challenge in Re-define BIM Workflow”?